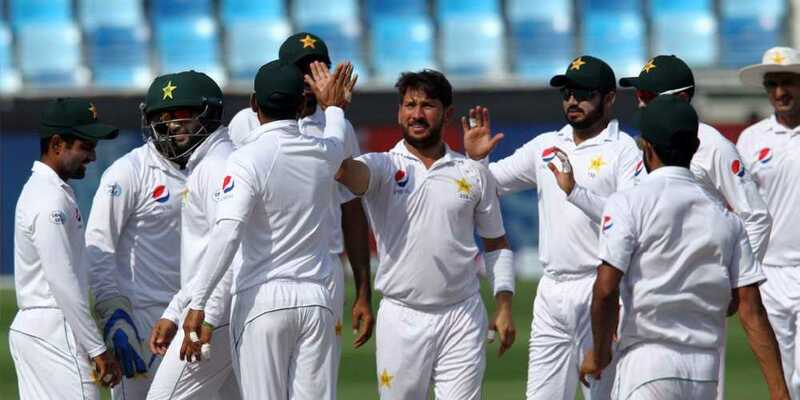 Leg-spinner Yasir Shah followed his extraordinary first innings performance with a six-wicket haul as Pakistan beat New Zealand by an innings and 16 runs in the second Test in Dubai on Tuesday to level the series 1-1. The 32-year-old, who took 8-41 on Monday, had figures of 6-143 in the second innings for a match haul of 14-184. New Zealand -- following-on after being dismissed for 90 in the first innings -- were bowled out for 312 soon after tea on the fourth day. "I came to know yesterday (about Imran Khan´s record) so it´s an honour that my name will come with him," said Yasir. "I haven’t bowled as well as this, especially with the pitch offering turn and bounce like it did. We wanted to put the disappointment of the first Test behind us and set up the series." Yasir’s figures are the second best match return ever for Pakistan in Test cricket, bettered only by former captain and current prime minister Imran Khan who took 14-116 against Sri Lanka in Lahore in 1982. They are also the best by a Pakistani bowler against New Zealand, beating Waqar Younis´s 12-130 in Faisalabad in 1990. Medium-pacer Hasan Ali was also at his best, taking 3-46 as Pakistan gained a measure of revenge for losing the first Test by four runs in Abu Dhabi last week. The third and final Test starts in Abu Dhabi from Monday.